The last major battle of the Civil War at Fort Blakely, Alabama, on April 9, 1865, was quickly overshadowed by the concurrent surrender of Robert E. Lee's army at Appomattox, and is largely forgotten today. 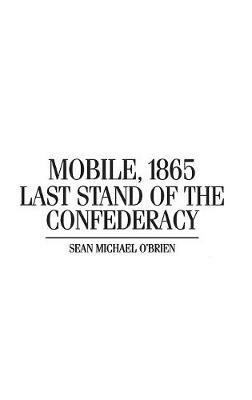 And yet the Federal campaign against Mobile, the last important Southern city that remained in Rebel hands, was a significant military operation involving 45,000 Union soldiers and 9,000 Confederates. Faced with overwhelming odds, diehard Rebels refused to surrender, and--even with the end of the war clearly at hand--Federal soldiers remained willing to fight and die to capture the last enemy stronghold. O'Brien explores the battle and the driving forces behind it in the first comprehensive treatment of the campaign in over 130 years. The Mobile campaign sheds light on the workings of unit cohesion in the closing days of the war--a bond of loyalty forged by four years of hardships, with soldiers no longer fighting just for country or cause but for their own band of comrades. Black solders (ten percent of the Federal army in the Mobile campaign) were further motivated by another factor: to end slavery and to prove African Americans worthy of equality. Soldiers in this campaign faced the full fury of America's war-making science, with innovations like trench warfare, rifled artillery, land and naval mines, army-navy amphibious operations, submarines, and minesweeping operations--all new technologies to be perfected by a later generation in World War I.